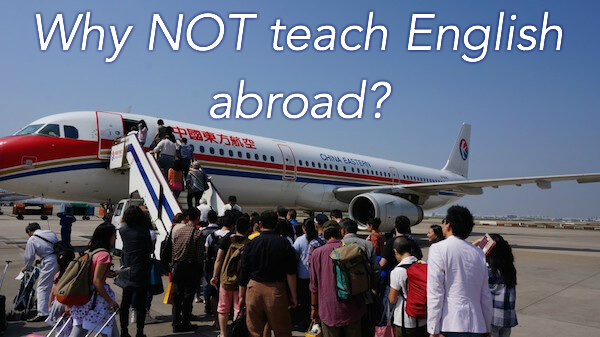 Why not teach English abroad? Is teaching abroad a good idea? The fact is that it is not for everyone. Here you will find 15 reasons why teaching abroad might not be for you. If you can remember only two of these reasons then remember the first two. They are the most important. If a lot of these apply to you then I probably wouldn't consider teaching abroad. Being open minded is the single most essential ingredient to having a successful experience abroad. If you don't have an open mind then it's pretty much not for you. You have to be open to trying new things because everything will be different when you go abroad. The environment, the language, the food, the culture, your job and the people will be different from what you are used to. 2. You are not interested in "teaching"
Two of the three main keywords in this post are "teaching English". And while "abroad" may sound appealing it's important to keep in mind that you will be "teaching English abroad" and not taking a "vacation abroad". If you are teaching "full time" you will be "teaching English" or preparing for it 6-8 hours a day. If you work in a public school in Korea, such as in a program with EPIK or in a public school in Japan with the JET program you will be working 40 hours a week for 1 year. That's 2,080 hours out of 8,765.8 hours in a year. That's roughly 25% of your time during the year and about 50% of your time awake that will be spent teaching English. If you don't think that you are interested in this or in learning about this then you probably won't enjoy your time spent abroad - well, at least half of it. And if you are not enjoying it it's unlikely that your students will be either. So if you want to have a better experience you might want to get some training. A lot of TEFL courses use pictures of beaches in Thailand to market their courses. And I know it looks appealing, yet remember it's teaching and not a vacation that you are going on. If you can't commit to a year then you might have some problems. Almost any full time job that will hire you and provide a visa for you will make you sign a contract for one year. There are other ways of getting visas and finding short term jobs teaching abroad, but for the most part you will need to commit to a year. You might find this helpful for finding a good ESL job. If you think you can get by just speaking English, you're right, you can, but you'll still be in for some unpleasant and frustrating times. You don't need to learn it to teach English, but it's going to help with the other half of the coin - the living abroad part. Learning the language is going to make you feel more connected to your environment and thus happier. What kind of food do you like to eat? If you are not interested in foods from other countries then you're going to be in for some challenges. Cooking your own food is an option, but you are not going to find the same things in the supermarket there as you will at home. Bigger cities tend to have more options for food, but it is still not home. "The food. I don't like the food at all. So it gets kinda expensive cause I buy American food." If you are very connected to your family and friends and are not willing to give that up for at least a year then it's not for you. You are likely to spend some time alone - at least at first. You will be in an unfamiliar setting. Your friends and family will not be there to support you. Living in a foreign land can be isolating at times. Since everything will be different you're going to have to adapt. If you have a fixed mindset on how things should be then you are in for difficulties. Different cultures bring different expectations, circumstances and ways of doing things. You don't have to be a big risk taker to enjoy teaching abroad, but you are going to have to take some risks to get from where you are now to the place you want to go. Consider them "calculated risks" and do your research. If you haven't traveled much or you are not interested in traveling then I wouldn't suggest it. But if you do remember that traveling abroad is not the same as teaching abroad. Most jobs teaching English in Asia are for positions teaching children. But if you don't like kids don't despair as there are jobs out there teaching adolescents and adults, but they are fewer. According to this data I discovered about teaching in Asia there are possibly 10 times the number of jobs for teaching kids compared to teaching adults. You will need patience in the classroom with your students, conversing with your boss, coworkers and talking to the average Joe on the street. The language and cultural differences will be an obstruction at times. Since they won't speak your language or completely understand your culture. Teaching isn't really a big money maker. But I would warn you if you are exclusively into a place like Korea for the money. I wouldn't just go some place for the money. There are a lot of different countries out there where you could teach English in. I suggest having an interest in the country where you are going and not exclusively in some other thing such as the money or because your friend is there. For the most part you need a bachelor's degree and to be a native speaker to teach abroad. These are the basic requirements. Schools can also have their own preferences as well. If you don't have these then there are still some opportunities, but they are fewer.